Black Friday Through Cyber Monday Specials! Below are some great deals on our fitness programs AND the last time you’ll be able to purchase a LIFETIME ALL-ACCESS PASS to all of my programs! LAST CHANCE TO GET A LIFETIME ALL-ACCESS PASS TO ALL OF MY PROGRAMS! What does a lifetime, all-access pass mean? It means you’ll get access to ALL of my programs for this one-time fee. And guess what that also means? You’ll also get access to programs I haven’t yet released (like my 6-Week Macro Cycling Shred) and even programs I may never release individually! So if you want this all-access pass to get everything I’ve created (my Booty Burner Program, Core Challenge, Pull Up Challenge, FOLLOW ALONG VIDEO WORKOUTS, Battle Ropes Program, Suspension Trainer Program, Mini Band Program, Foam Rolling Course, Recipe Library, Workout Library, Exercise Library, Fat-Loss Progressions, Macro Shred Challenge (not yet released officially otherwise), 21-Day Kickstart, Injury Prevention Progressions…Programs you can’t even get a deal on below…), you can for this ONE-TIME fee (my Library is usually $397 a YEAR and you’ll get everything for a ONE-TIME FEE, aka NO REBILLING EVER, of just $197). 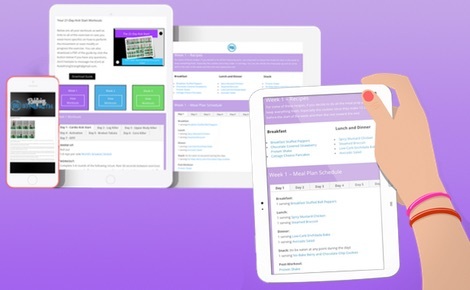 After Cyber Monday, the Elite Workout Library will not be available to any new members! So if you want to get EVERYTHING for this ONE-TIME FEE, you’d better get it NOW! And this price is also 50% OFF MY USUAL YEARLY RATE! Get the Lifetime All-Access Pass for just a ONE-TIME FEE, aka YOU WON’T BE BILLED AGAIN EVER, of $197 (usually $397/YEAR)! Get The All-Access Pass For A ONE-TIME FEE! Looking For Something Specific? Check Out Our Other Program Deals! You all know I’m glute obsessed. That’s why I experimented and worked to create a kickass 28-day glute activation and toning program (that can also help with that lower belly pooch!). Get it below for just $9.99! If you love the core moves I share, you’ll love my 30-Day Core Challenge! In this program I’ll help you build a stronger core by working everything from your shoulders to your knees, down your frontside and your backside. If you want a stronger core, join the 30-Day Challenge for 50% off. Now just $15 with code RSCORE entered at checkout. I LOVE Pull Ups. And most people that come to me want to improve them and achieve that first full one. That’s why I created the 30-Day Pull Up Challenge. 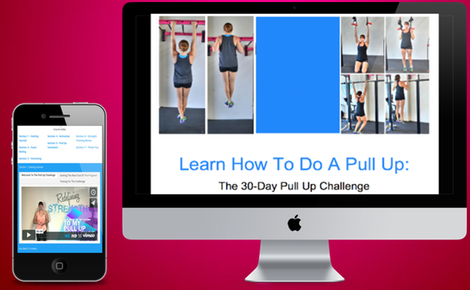 30 days to stronger Pull Ups…I guarantee it! And now 50% off with code LOVEPULLUPS at checkout. Now just $24.50. That’s more than worth it to be able to say you can do one! If you’re looking through all of the programs and want these and MORE, you really should think about my LIFETIME, ALL-ACCESS PASS! Not only will you get all of these programs, but you’ll also get Follow Along Workout Videos, the 6-Week Macro Shred and so many more courses and workouts, you’ll never need another program! PLUS, you get access to my private community full of wonderful people to help keep you motivated! Get The All Access Pass! Yes…I know it isn’t summer…But this 10-Week Bodyweight Workout program is really great for ANY time of year. This is the perfect home workout program if you are looking to change your body composition and get stronger. Get 50% off with code NOTSUMMER at checkout. Get the program for $10, which is just $1 per week! 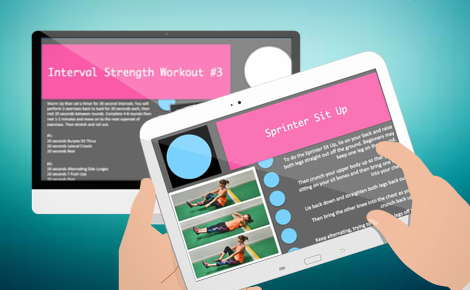 If I could force people to do TWO PROGRAMS, it would be the Booty Burner and this one…The Posture Fix. Actually I do force most of my in-person clients to do both. Because both are key to preventing injury, feeling better, looking better, lifting more and running faster. The 21-Day Posture Fix is made up of 10-minute workouts that will open you up especially if you sit hunched over a computer for 9 hours a day. 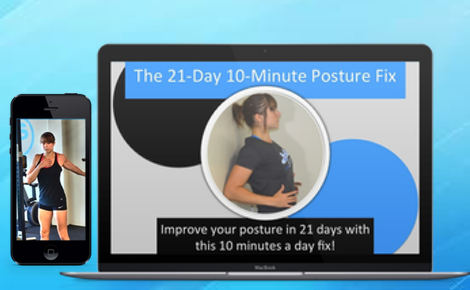 Prevent and alleviate aches and pains with the Posture Fix which is just $7 this weekend! That’s not even a dollar a day you are spending on feeling and moving better! Enter code FIX at checkout! This is one of my favorite programs for this time of year and heading into the New Year when you need a little kickstart. When you’re struggling to get on track, it can be hard to commit to something long term. But 21 days is a manageable time frame and the workouts and meal plan are quick and easy to use. That means no matter how busy and stressed you get, you can easily stay on track! Enter code 21DAYS at checkout for 50% off. Get the program for $10.50! A lifetime, all-access pass to my Library and even my Library Membership in general WILL NOT BE AROUND after this weekend! I won’t be accepting any new members after Cyber Monday! So if you want EVERYTHING for a ONE-TIME FEE (please don’t ask me if this will rebill again because THIS WILL NOT REBILL…I REPEAT ONE-TIME FEE), you have to get the Library NOW for just $197! This is your LAST CHANCE for an ALL-ACCESS PASS!